From little league players to big leaguers, we have the most innovative batting tees and hitting aids for training baseball players. Our batting practice aids are designed to help establish and reinforce proper hitting mechanics and muscle memory while making baseball practice more efficient and fun. Training tees for baseball teach hitters how to produce a swing that approaches the proper angles in order to hit the ball harder and farther. The proper swing will ensure they hit more doubles, triples and home runs. Our hitting tees and aids are the perfect solution for coaches looking for universally accepted methods for improving swing mechanics. Our batting practice aids are perfect for all ages, incorporate the most innovative techniques, and are built to withstand frequent, rugged use. These hitting aids are perfect for teams or backyard practice and are easy to transport and store. Shop now to enjoy our competitive prices with free shipping on select orders or give us a call at 877-300-0087 to speak with one of our experts. The GripRite HitRite forces your hands into the correct hitting position by pushing your palms off the bat and placing it in your fingers. Fits over your existing bat grip. Develops more power, improves contact, and creates a smoother swing. Available in youth & adult sizes, for righties & lefties. 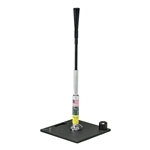 The Hands Back Hitter™ Youth Model is the simplest, most affordable, yet most instructive training aid on the market. Keeps your youth hitter training and swinging right even when you're not there. Uses plastic balls only. This NEW, patented baseball and softball batting trainer is designed to improve bat speed, power and develop a more consistent swing. FREE SHIPPING! The Perfec-tee Batting Tee Attachment produces a perfectly consistent swing path and provides instant feedback with each swing. Attaches to virtually any batting tee. The Pinch Hitter makes hitting practice much more efficient, while improving player's bat speed and hand-eye coordination.